It started with surgery, for gallstones. That was Wednesday. Resting at home, attempting nothing challenging, the lightest of food (miso soup), even after no solid food in 24 hours. Thursday I managed my senior fitness hour — the old g(r)ay bear, he ain’t what he used to be — with great effort, but without using my walker. And then my reward, a return to real food: a Mexican Caesar salad at the restaurant Reposado, up the street from me. Delicious, but only distantly related to classic Caesar salad. The surgery. This was prefigured in my May 22nd posting “A medical mouthful”, about the term endoscopic retrograde cholangiopancreatography (almost always, mercifully, referred to by the initialism ERCP). There was an anatomical diagram, and I noted that I had gallstones and would undergo surgery on June 7th. This is the easy scenario. There are several much more complex scenarios, which the surgeon explained to me in detail. Easy scenario, brief surgery; more complex can take up to 4 hours. Mine was easy as they get. An exploratory MRI showed one large stone. The surgeon explained that the MRIs almost always missed stuff, and that one stone in the image probably meant three. I had four. Still there’s a lot of preparatory time and then a lot of recovery time, so that door-to-door it took about 7 hours. You will have a sore throat, because of that tube; I did, but it was minimal. Lots of other possible side effects and complications, none of which I experienced. To which you can add grilled chicken, salmon, or shrimp. I added salmon, rare (virtually sashimi). A Caesar salad is a salad of romaine lettuce and croutons dressed with [grated] parmesan cheese, lemon juice, olive oil, egg [raw or coddled], Worcestershire sauce, garlic, and black pepper. It is traditionally prepared tableside. The origin story is murky, but involves restaurateur Caesar Cardini in the mid-1920s; According to Wikipedia, the first documentation of Caesar salad dates to 1946, by which time it was a food rage in Hollywood. Now, the Reposado version depends crucially on the corn kernels and the toasted pepitas, which give the salad a wonderful crunch. Pumpkin seed, also known as pepita (from Mexican Spanish: pepita de calabaza, “little seed of squash”), are the edible seeds of a pumpkin or certain other cultivars of squash. The seeds are typically rather flat and asymmetrically oval, and light green in color and may have a white outer hull. Some cultivars are hulless, and are grown only for their seed. 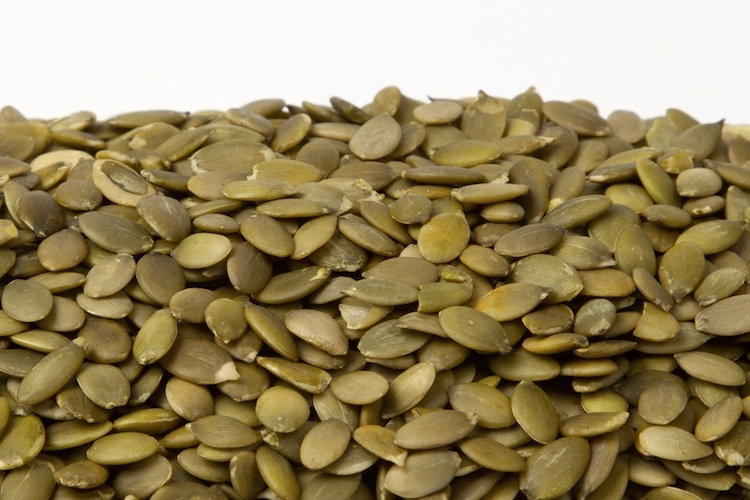 The seeds are nutrient-rich, with especially high content of protein, dietary fiber and numerous micronutrients. The word can refer either to the hulled kernel or unhulled whole seed, and most commonly refers to the roasted end product. 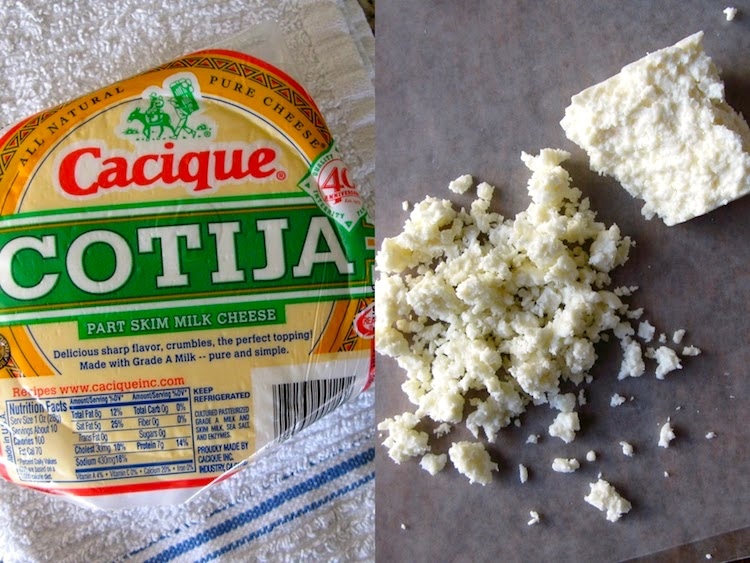 Cotija is a hard cow’s milk cheese that originated from Mexico. It is named after the town of Cotija, Michoacán. Cotija comes in two primary versions. El queso Cotija de Montaña or “grain cheese” is dry and firm, with little taste other than saltiness (the cheese is usually several times saltier than typical cheese, traditionally for preservative reasons). “Tajo” cheese is a moister, fattier, and less salty version that holds its shape when cut, with a flavor similar to Greek feta. Añejo cheese (Queso añejo) [añejo ‘aged, old’] is a firm, aged Mexican cheese traditionally made from skimmed goat’s milk but most often available made from skimmed cow’s milk. After it is made it is rolled in paprika to add additional flavor to its salty sharp flavor, which is somewhat similar to Parmesan cheese or Romano cheese, but not as strong flavored as Cotija cheese. As a fresh cheese, it is crumbly and breaks into small pieces very easily. When dried it acquires a firm texture allowing it to be easily shredded or grated. Queso Añejo is a good baking or grilling cheese, which is generally sprinkled on top of or stuffed into enchiladas, burritos and tacos. Parmesan, Cotija, or Feta cheese can be substituted when Añejo is not available. This entry was posted on June 10, 2017 at 6:53 am and is filed under Language and food, Language of medicine, My life. You can follow any responses to this entry through the RSS 2.0 feed. You can leave a response, or trackback from your own site.